Looking to gain skills in an industry with many career opportunities so you can improve your earning potential? The Information Technology industry continues to expand and has a high demand for skilled specialists. If you’re ready to move up and create a brighter future with a rewarding career, Laurus College has the IT programs to get you there. Computer networking offers businesses, schools, small and large corporations, and families several benefits, including faster access to more information, improved communication and collaboration, and more convenient access to software tools. Many companies want to have a staff member who can maintain the company’s personal computers (PCs), maintain their information systems, and support their non-technical PC users, while other companies need staff who can go onsite to service computer problems. Is a Career in IT Right for You? Find Out! 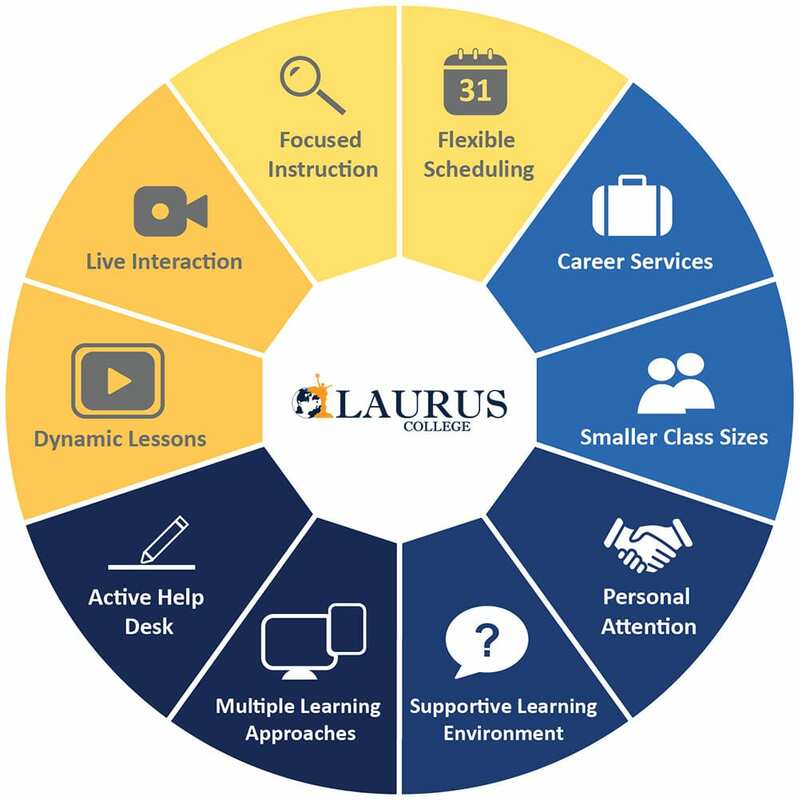 Take the "Laurus College IT Career Training Readiness Quiz"
Information Technologies & Network Systems professionals provide technical assistance concerning the use of computer hardware and software as well as perform network maintenance to ensure networks operate correctly with minimal interruption. They may also plan, direct, or coordinate activities in such fields as electronic data processing, information systems, systems analysis, and computer programming. The Standard Occupational Classification (SOC) system is used by Federal statistical agencies to classify workers into occupational categories for the purpose of collecting, calculating, or disseminating data. The Information Technologies & Network Systems Occupational Associate Degree Program offered at Laurus College can help prepare graduates for a variety of careers that include, but are not limited to the list of careers that may be listed under the following SOC codes (for more information on a particular SOC code, visit www.onetonline.org). That means you’re in control of your learning experience. All you have to do is take that first important step. Pursuing training with Laurus for a profession in the IT world, with all our dedicated support from Day 1 till you land that dream job, will be a wise move. Our career-focused program helps you gain an understanding of how computer networks and information systems work, while preparing you for potential employment in the IT and network service fields. 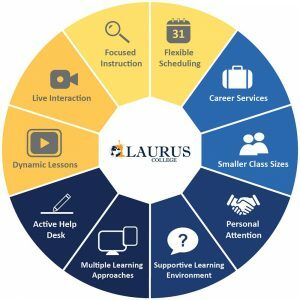 With a program led by industry professionals, Laurus helps motivated people get the skills, experience and ongoing support to pursue successful careers. If you’d like to know more about the careers available to grads of our Information Technologies & Network Systems program and explore whether Laurus is right for you, fill out the form on this page to receive more information. Students begin learning about computer hardware and each item that makes up a computer. Students build the skills needed for proper file management, and learn to troubleshoot basic problems that may occur during computer usage. Students study the system board in depth, learning about components, as well as, their functions. Other topics covered may include computer memory, different operating systems, floppy drives, and hard drives. Students also work with computer power supplies, learning how to measure output and proper removal and replacement of power supply units. Students learn to handle several system types and troubleshoot various computer hardware issues. Students study how to properly set up and install hard drives, as well as techniques for proper troubleshooting and data recovery. Students examine how to protect the hardware and software of a computer while troubleshooting, and how to properly use tool kits and troubleshooting reference guides while isolating and repairing a number of computer problems. Other topics studied may include ports and expansion slots for add-on devices, SCSI devices, keyboards, pointing devices, multimedia technology, monitoring system performance, and support devices. Students install and study about supporting applications with various operating systems. Students in this course study operating systems designed specifically for networking, as well as the differences between various operating systems. Students install and customize operating systems, utilize system registries and diagnostic tools, and troubleshoot problems that typically arise in various systems. Other topics studied may include communication over the internet, browsing the World Wide Web, utilizing email, transferring files, communication over phone lines, and modems. Students study the basic principles of networking and networking concepts, as well as discover different types of network architectures and learn about various networking software and protocols. Students learn about many of the computer and printer problems that commonly occur in the workplace, and how to effectively troubleshoot and fix those problems. Students discover proper maintenance techniques for computers and printers in an office setting. Also discussed in this course are proper disaster recovery and maintenance plans for computers, how to create system backups, and viruses and other computer infestations. In this final course of the program students prepare for the coming A+ Certification examination. Students practice with pre-examination questions designed to gear him or her for the task of taking the real exams. The pre-exam questions used in this process may increase the student’s comfort level with the exam and may increase the student’s success rate at passing this exam. Starting with an introduction to networks students gain an understanding about communication services, mail services, and management services. Students study networking standards and models, and study the various layers making up networking as a whole. Students gain an understanding of different network protocols, and their functions. Students explore networking media and learn to install protocols on various operating systems. They examine the difference between LANs and WANs, and the transport systems that serve them both. Other topics covered may include installing NICs in computers and configuring them for various types of networks. Network hardware such as hubs, repeaters, bridges, and routers may also be examined in this course. TCP/IP suite of protocols provides the basis for networking communication. In this course, students will review several of the transmission and networking protocols and applications, decimal-to-binary conversion, classful and classless addressing, mapping Internet addresses to physical addresses, and error and control messages. Network Administrators must understand a variety of key networking concepts and technology that include storage, network architecture, Voice over IP implementation, and server consolidation. In this course students come to understand the common causes and high costs of service outages, how to measure high network availability, how to design a data center and explore what must be considered with consolidating resources. Students in this course examine the essentials of a WAN, and learn how one is implemented and how remote connectivity is established. Students gain understanding of various network operating systems and how they are similar or may differ from one another. Students gain an understanding for how to establish users, groups, and rights in a networking system. In this course, students learn to plan, control, and manage the deployment of a network system. It will encompass documentation, operating system application governed by the system role. Students work with GUI (Graphical User Interface) based applications as well as the CLI (command-line interface) to accomplish tasks. GUI and CLI applications include Windows PE (Pre-installation Environment), Microsoft Visio, WDS (Windows Deployment Services), AD DS (Active Directory Domain Services), MDT (Microsoft Deployment Toolkit), and Windows AIK (Automated Installation Kit). Network System Services provide the structure for authenticating and authorizing users in the work place. This course prepares students to manage and administer these services in a Windows Domain environment. Topics include Active Directory, Group Policy, File Services, DNS, Remote Access Management, Server Management, and many other supporting services. Students are introduced to core database concepts, objects, data manipulation, storage structures, and administering a database. This course includes skills that prepare students to design, manage, and secure relational databases and an understanding of structured query language. Students combine acquired skills from previous courses to capitalize in the process of IT and Computer Networking management. They plan, coordinate, document, and direct computer and network related projects within sets of scenario guidelines. Students will learn to project, set achievable business goals, and align projects to reach those goals. This class will increase your understanding of potential threats, learn how to apply practical mitigation options, and react to attacks quickly. The class teaches you the skills and knowledge you need to design, develop, implement, analyze, and maintain networks and network protocols. It explains how these systems currently operate and the limitations that lead to security weaknesses. Topics covered in this course may include the fundamental issues needed to understand network security, the definition of security terms, security ethics, the OSI network model, and cryptography for networks. Students may explore the common risks for secure network design and development, including the impact of modularity on security and a summary of the general security issues.